A good knife is a vital tool. A proper knife is one of the most significant pieces of equipment in any kitchen. 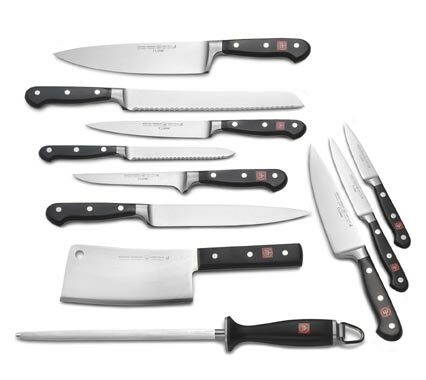 I’m probably quite unusual – I don’t have a block full of knives, bought as a set or given as a wedding gift. Instead, I rely on just a couple of blades. I made a conscious decision when I entered the world of gainful employment to buy just two knives, but to buy the best I could get my hands on. I researched the market intensely, scoured the Nisbetts catalogue for hours, quizzed My Brother, The Chef, spoke to the knowledgeable staff at Peter Maturi’s before deciding that only German steel would do, and of the German knives, only Wusthof really cut the mustard. I bought two Wusthof knives – a 12 inch cook’s knife with a healthy weight, made out of a single piece of hardened steel and a smaller 6 inch version, essentially a vegetable paring knife. I also went crazy and bought a pair of Wusthof kitchen scissors, capable of cutting straight through a chicken carcass. The 12 inch blade has survived well bar a few nicks and dents, but the 6 inch blade has bent ever so slightly, the result of an over exuberant attempt to hasten the defrosting of a block of frozen chicken stock by repeatedly stabbing it to break it up. Foolish, youthful stupidity. Wusthof knives are engineered to precise tolerances and have a slightly more exaggerated curve than you’d normally expect, which allows the knife to rock backwards and forwards against a chopping board, making cutting and slicing easier. My knife collection has been expanded only recently by the addition of a couple of very short Victorinox knives, 3 inch blades, plastic handles, very cheap at £2.99 each but a quality blade and extremely sharp, perfect for prepping onions and other veg. The most important factor in selecting a good knife, the right knife for you, is the way it fits in your hand. It must be comfortable to hold, and not all knives will be. Try a few out. The second factor is the blade itself. In a large knife, it’s essential that the whole length of the knife is cast from the same piece of steel. The handle may be bolted or glued on to the tang, but the tang must continue through and become the blade. This gives the knife weight, strength and structural stability. Buying a knife is not the end of the matter. It must be stored safely, either in a block or on a magnetic knife rack (Ikea, £6, absolute bargain). Never store a sharp knife in a drawer – the blade will get damaged, and so will your hand. Knives must also be kept sharp. Very sharp. I prefer an old fashioned steel, but the various knife sharpening tools are all good enough if used correctly. For more advice on how to sharpen a knife properly, ask a butcher or a fishmonger to show you. They depend on their knives, and you can bet your bottom dollar they know how to keep them in prime condition. A razor sharp knife is a safe knife. This might seem paradoxical, but a very sharp knife will cut more cleanly and efficiently, won’t slip as readily on the surface of food and, if it does cut you, as it surely will at one point or another, will leave a cleaner wound that is likely to heal faster. So, throw out your cheap knives and invest in a couple of good blades – a big one and a small one – store them safely, and keep them very, very sharp.